How is society going to support this silver tsunami? asked author Martin Amis in an interview in a Sunday newspaper, fretting that advances in medical science mean that restaurants and shops will be 'stinking' with 'demented old people'. He went on to wonder how a civil war between the old and the young is to be prevented. Ah, of course, his answer is for there to be a euthanasia booth on every corner where oldies pop in, get a Martini (a Martini? ), a medal and a terminal dose of something or other. Unsurprisingly, though, the author hasn't quite worked out the details. Who does Martin Amis think he's kidding? Even by his own tawdry standards, this seems more than a little attention-seeking. After all, he has a new book to publicise and a statement of such crassness has attracted much-needed attention. Amis's statement was provoked, he tells us, because his stepfather, Lord Kilmarnock, 'died very horribly' last year. So how do you deal with a dying person who is selfish enough to refuse to top themselves? Amis doesn't tell us. Yet. Maybe he won't espouse compulsory attendance at your neighbourhood suicide booth until his next book comes out. All this self-publicity is not to say that Amis hasn't genuinely been worrying about old age. I much enjoyed the books of his father, Kingsley, even if he did go on and on for decades about the fear of death until he finally left us at the age of 73. It seems that this great literary legacy lays heavily on his son. Indeed, Amis the younger is struggling with the fact of his own ageing. He has taken turning 60 very hard. The knowledge that novelists tend to go off at about 70 has Amis in 'a real paranoid funk'. Maybe he started too early in the family business? 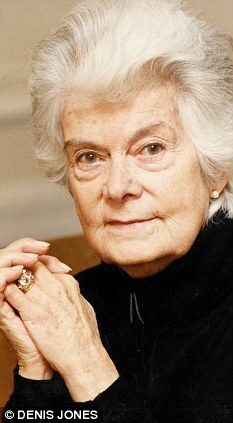 After all, author Mary Wesley, who sold possibly as many books as Amis pere et fils, published her first novel at the grand old age of 71 after changing course after a complex life, romantically and financially. Like father, like son? 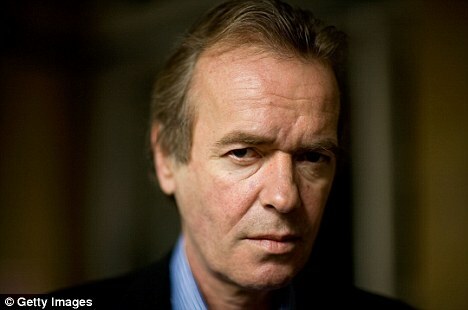 Martin Amis (R) is in a 'paranoid funk' about novelists dying at 70. Oddly enough, her first novel was about suicide, but it didn't stop her writing for another 13 years about youth, danger, war, scandal and excess. But then, Wesley had had a real life before putting pen to paper. I am a writer too - though obviously not one with the pretensions of Martin Amis - but I have news for him. It is not only writers who worry about death or about the diminution of their talents or their energies as they get older: surgeons do; plumbers do; shop assistants do; homeless people trying to survive a cold night do. Everybody does. No wonder, then, that the Equality And Human Rights Commission yesterday said that people should be allowed to work beyond the current retirement age and that working times should be more flexible. We all want to be useful in some way or another in our later years. Of course, we all have to deal with knowing that death is as inevitable as Gordon Brown's taxes. It is a very frightening aspect of the human condition. So, too, is the knowledge that we may end up paralysed or senile. The point is to get some perspective and make the most out of what life we have. What is important is how we deal with it. When, in December 2008, the great Alfred Brendel gave his last public piano recital at the age of 77, he announced that he was looking forward to a retirement which would give him time to do more writing and lecturing. That's the spirit, Maestro. And it's an approach we can all usefully emulate. So if Martin Amis finds that he can't write any more, he should do more teaching. And when he can't teach, maybe he could help out at his local school encouraging children to read. Or learn more about a positive approach to death by helping in a local hospice. There, he might even get the inspiration for another novel of the kind we can all benefit from: one that tells us how to face the challenges of life and death with courage rather than defeatism. I have to declare an interest. I have never been ageist. In my 30s I had friends in their 70s, as now in my 60s, I have friends in their 20s. Regularly, I mourn friends whom Martin Amis would have thought ripe for their lethal Martini decades before they finally died. One of the joys of my life is arguing with the young from our very different and mutually instructive perspectives. We have so much to gain from each other, yet an increasingly structured society tends to drive us apart. I offer two simple truths: first, unless we learn from previous generations, we are diminished; second, most people want to be useful and the more busy and productive a life they have had, the more they want to go on making a contribution. It was relatively simple in the world of Lark Rise To Candleford or even when I was a child, visiting relatives in rural Ireland. Quite simply, you went on working in the fields or the home until you fell down. Great-grandmothers might not be nimble enough to pursue a toddler, but they could always deal with a baby or cook or tend the fire. It gave them a sense of purpose and worth that goes when you are told you have reached a particular age and your working days are over. The pressure on government from the Equality And Human Rights Commission to abolish an automatic retirement age is part of a vitally important debate about how - as we live longer and more healthily - we can help society. We need plenty of honest debate. Why, if politicians and judges and popes and actors and, indeed, writers, can go on and on, are most people chucked out of their jobs at 60 or 65? Is it simply to make promotion opportunities for the middleaged so as to open up the job market to the young? Is it to avoid the appalling vista of wasteful wrangles at employment tribunals? Or, as the advocates for older workers say, are we just wasting the experience and wisdom of the old because of our rigidity and inflexibility? If we are to be brave, there are many questions to be addressed. How can we develop a sensible approach to flexible and parttime working to enable people to wind down at the rate they would like? How do you get rid of the lazy jobsworth who will cling on if he can although he should have been fired years ago? What do you do with the 69-year-old who has been an exemplary member of staff but has suddenly become doddery? But these are technical questions which should not distract from the big one: how do we find ways of using people with talent, experience and an anxiety to serve society? It's the voluntary sector, of course, which is being increasingly hampered by ageism and pointless regulations. I've had too many friends who tried to be useful after retirement and were driven away. I'll never get over the eighty-something who was stopped from helping children to read in her local school because she hadn't been cleared by the Criminal Records Bureau. A Cameron government has a golden opportunity to use the goodwill, experience, generosity and wisdom of older people to help rescue the 'broken society'. The alternative is inexorably to move towards culling those 'inconvenient' people who pass a determined sell-by date and fail to tick the bureaucratic boxes or fit the inflexible grooves. Does Martin Amis really want to be the poster-boy for such an approach to the richness and challenge of life and death - a subject that has absorbed the greatest writers throughout our history? Would Sir like a Solent Green with that? And besides... I hardly think an incontinent, dementia ridden silver army of geriatric retirees is going to be much of a match against the rabid armies of politicians, guangoists, hangers on and doleites created by nu-labia. Oh dear, what a nasty way of ensuring publicity for a book - quite disgraceful and not a bit as witty as his father. Perhaps Martin Amis will think differently when he is a little more mature. Read his cr*p and weep. What rubbish! I am 84 and I believe I make a very useful contribution to our society. I am chairman of the managing committee of the Karmiel English Speakers' Club. I am President of the Association for the Karmiel Children's Village, responsible for fundraising to make the difference between existing and living for 220 kids from broken homes. I tutor Israeli kids in English and English Adults in Hebrew. Don't have time for much else!!! hat right has he to comment?.He is a fiction writer,not as good as his dad. Who considered him as an intellectual. ?The other night on t/v he couldn't string a sentence together and looked zonked. Who is Martin Amis ? Martin Amis do us all a favour and set an example of what you are so cruelly advocating. "- Dave, Edinburgh, Uk, 26/1/2010 11:56"
I wonder what the young would do when they wanted free child care if all the elderly dissapeared ? I am still working part time and generating income for the country not sitting about on my backside writting garbage books only fit for the recylcling box. Who the hell does this prat think he is? "The trouble with today's youngsters...."
What an insulting and pretentious pensioner Martin Amis is. Someone tell him, he's just a bloke, who writes and not some wondrous elevated being, 'A Writer' (you know, the ones that 'die twice'). He needs to get over himself! I'm going to live until I die and in doing so torment the young. Old people are simply no use to society and we all have to accept this. Children also contibute nothing, they just consume. Teenagers are a serious threat to society, we all know that. Middle aged people are boring and somewhat crass. He is too busy selfishly and piteously examining his own navel to have any compassion or humanity for others. And at the rate he is going he'll worry himself into an early grave anyway. What keeps many elderly people feeling young is an attitude of mind that Martin Amis doesn't appear to have. Never mind Martin, you don't have to go into the local care home. I can't imagine you sitting in a singing circle belting out On Mother Kelly's Doorstep. You can opt for one of those Hampstead Heath Retirement Homes for Literary types instead where you can sit on your inflated cushion and rage against the world. And don't worry, you can still produce a book - a Memory Book. We all know we have a broken society: except New Labour of course who created it yet are in total denial. What better way to mend it than to have a new societal attitude towards old age and how we deal with it. I am fed up with hearing that the only solution is euthanasia. Martin your book is offensive in the extreme,,,,,,, You cannot discrimminate against Age, as you to will become old , hopefully not incontinent ! The real scandal is that we already do "assist" elderly people to die. Whether they want to or not. The Liverpool Care Path was developed for patients facing imminent death in hospices. It has been enthusiastically adopted by the wider NHS, not just for patients who are about to die naturally, but for those whom medical staff judge SHOULD die. Is it an accident that our cultural values have become so superficial and those who are not easy on the eye or economically active in some way are increasingly marginalised? Or is it that much easier to control society when you don't have to deal with well-educated, intelligent and experienced citizens who are difficult to manipulate? Particularly when there are UN population control targets to be met. 60 eh - so I will go along with this disgusting idea of how he thinks of himself if next week, or not sooner ,he just finds himself a booth pours himself his poisonous chalice and promptly rids us of his overinflated opinions. May I remind this odious terwp 'How we treat the elderly is how society is judged'.........nincompoop! Old people have a lifetime of experience. Some of them (not all, but certainly some) have developed that precious thing we call wisdom. Many of them can be quite wickedly funny. Often, they remember things the "great and the good" would far rather were forgotten. They are well worth treasuring. My favourite aunt died in her nineties. She was sharp as a pin right to the end, and very well worth talking with. It was an effort, because she also became very deaf, which she used to manipulate quite unscrupulously. If she didn't like the way the conversation was going, her hearing aid would always begin to play up. But she was always worth the effort, and at her best she was a complete delight. At the end, she gave us a marvellous example of how to die with dignity. 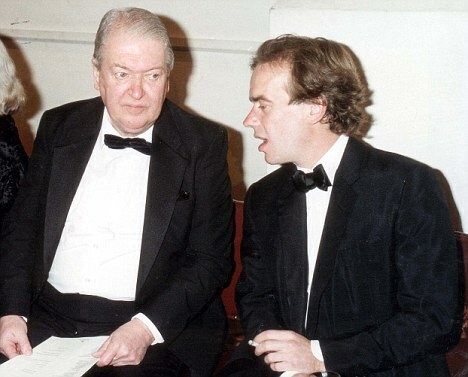 Martin Amis used to be famous as a party animal and a member of London's gilded youth. I don't think he has ever come to terms with the fact that them days is gone. Flashy, talented at verbal pyrotechnics, but shallow. i once read a martin amis book or i should say i managed to get halfway through it when i started to get thoughts of euthanasia myself, at the end i gave up and threw it away, total rubbish. Dont worry just another nut job who thinks he is a cut above the rest. Seen it all... Personally for his sake, recommend a good psychiatrist and then lock him away in a little padded cell for his own good! Still though in all good tradition, he is entitled to spew his venom, but what he appears to forget is that we are also entitled to reply!. There are thousands of elderly people who are cognitive , please go and find one and do a story on their response instead of wasting time with this imbecilic oaf. Everyone, and that does mean everyone, has to come to terms with the fact of their own mortality at some point in their lives; and for those who already have that is either good news or bad news. Unfortunately there are no equivalent Booker prizes this side of the Pearly Gates to sort out the good news from the bad and probably explains why Martin Amis is still struggling to come to terms with his own mortality. I was so appalled, having read the first few lines of Martin Amis' diatribe against his own generation, I could not be bothered to read further. Pure, simple, but very dangerous "attention getting". Dangerous.... if one, perhaps reads some of the really rude comments by younger posters, in response to your item on older women drivers. (This illustrates an intolerance induced in the younger generation by this "New Young Britain" government, where once there was respect, and indeed, the reliable knowledge as to who you could go to for wise advice). I never forget the words of a former boyfriend of mine, many, many, years ago, when we touched on "death" during a conversation. "What really get's me", he said, "is when an old person dies......so does...all that knowledge". No truer word, I thought to myself....a lifetime of knowledge, experience, and wisdom, those in their younger years cannot hope to have. What a waste! Here we go again. More argumenta ad misericordiam and ad hominem, straw-men, red herrings, false dichotomies and a half dozen other logical fallacies by another vexatious busybody who cannot let people live AND END their lives as they please. First of all, though I don't think Amis was serious in his proposition anyway, not even the staunchest proponents of voluntary euthanasia are suggesting bumbing off people over the age of x. Hence, "VOLUNTARY." Secondly, examples of what someone did or did not do at whatever age are a total non-sequitur. People who are tired of life (be it thru age, illness, disillusionment or anything else) should be able to end them in dignity. Thirdly, froth and foam all you want, mechanisms (legal and logistical) to facilitate voluntary euthanasia are an ineluctable part of the future. Of all the human rights being used and abused out there, surely the right to terminate one's existence is the greatest of them all. I assume that Mr Amis will be the first one to ...ahem.."volunteer" to try this out? Unlike the many older (and therefore no doubt uneeded) citizens who will no doubt be pressurised into nipping of a bit early ? Now then .....had he suggested they be built in Westminster from public donations......i dare say the maintenace would be horrific......considering the use they would be put to ! Getting rid of those who are a drain on "resources" should of course come first ! And we all know where to find plenty of those ! I've read this article too late (2.18am) to make any coherent comments or suggestions. What I will say is 'Bravo' Ruth - I totally agree with everything you have said.